Communicate. Keep track of outgoing email and create your own "paperless" office. File and store important out-going documents. Eventually you'll be able to translate your email messages into various languages such as German, French, and Spanish -- in seconds. 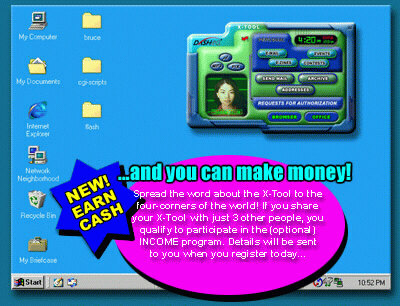 The X-TOOL lets you compose and send email with a variety of built-in tools. Pre-schedule to send out birthday greetings and electronic Christmas cards... months in advance. Use a powerful online thesaurus and spell-checker to communicate confidently.